For the upcoming Packaging Oscar 2019 Tubettificio Favia presents the new born among its collapsible aluminium tubes: ToBeNaturAl, the completely green evolution of ToBeUnique. A collapsible aluminium tube with a compostable bioplastic capsule, the natural evolution of a research for increasingly sustainable solutions. A true technological innovation that responds to the increasingly pressing needs derived from a market in which consumers show a greater awareness of environmental issues by changing their purchasing choices also based on ethical criteria. Brands, especially those who openly call themselves “green”, are referred to be coherent in every aspect of the production chain, including the choices regarding packaging. And this trend seems to be set to grow, as demonstrated by the viral success on social media of environmental initiatives, such as the documentary “Journey of a plastic bottle” by the Italian explorer Alex Bellini or the “no box toothpaste” campaign launched by the youtuber Alan’s Theory against secondary packaging considered superfluous, or the media impact of charismatic characters like the young Greta Thunberg. After European Union banned disposable plastic last year, public attention is increasingly focused on brands and their approach to packaging. The adoption of a sustainable packaging by brands can become a strong driver for the purchase. The packaging industry is therefore called upon to provide new solutions capable of maintaining high quality standards but at the same time understanding this new widespread sensitivity. Tubettificio Favia has decided to invest in research and to develop a technological solution that combines both tradition and innovation for environment’s sake. Thus, ToBeNaturAL was born, the collapsible aluminium tube with biodegradable closure capsule. Collapsible aluminium tubes are already identified as an excellent example of “green” packaging for the properties of aluminium. 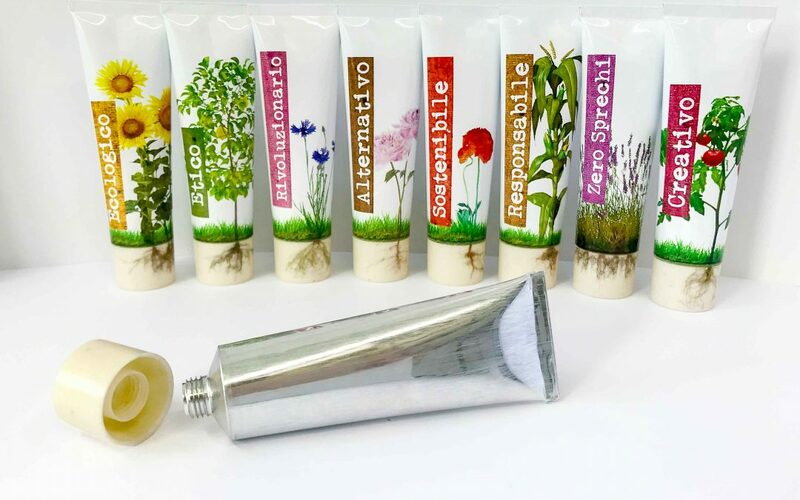 Favia can present a 100% recyclable and collapsible aluminium tube thanks to the collaboration with the Aba Srl, a leader company in the plastic molding for the cosmetic and pharmaceutical industries with the adoption of the IamNature® bio-technopolymer, produced by the Italian group Maip, recently winner of the prestigious international Bioplastics Award. The aluminium tube can be recovered while the bioplastic capsule after use can be thrown directly into the household organic waste, turning into humus for the soil from which other plants will arise. A true symbol of renaissance that goes well with aluminium, infinitely recyclable. ToBeNaturAL lends itself as good for all digital printing processes on aluminium, including ToBeUnique, the exclusive Favia digital printing technique that involves both the aluminium tube and the capsule in a single process. For surprising results and quality graphic rendering, so much so that precisely for this uniqueness the ToBeUnique print is considered a valid anti-counterfeiting solution. Even with ToBeNaturAL it is possible to implement the StealthCode® technology, a code invisible to the human eye that can be detected through a special free mobile app, available in the official iOS and Android stores. A solution that makes the collapsible aluminium tube smart, since it is enough to scan any part of the tube to be redirected to exclusive digital contents, such as video, landing page or survey. Or textual contents that are impossible to write on the small surface of a tube, and which would require an additional container, for example. In this way the use of StealthCode® makes secondary packaging superfluous and turns green packaging into a true digital communication tool, with a big difference compared to a QRCode: it does not disturb the graphics and is impossible to counterfeit. Among the first to believe in a completely sustainable tube, Eywa Cosmetics company, which produces ecological beauty products, which has already collaborated with us in the past and has chosen ToBeUnique to make their creams unique. Would you like to find out more about ToBeNaturAl and receive a sample of this new fully recyclable and sustainable tube? Please contact us.